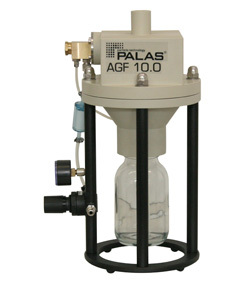 CH Technologies' AGF Series, manufactured by Palas GmbH, delivers a superior level of performance well suited to the filter test industry and high efficiency filters. It can produce very high particle concentrations of MPPS range particles. The AGF Series is highly effective with non-resinous oils, and was subjected to the most stringent testing with standard oils like DEHS and DOP. The use of an internal cyclone allows for the AGF Series to generate particles that are consistently in the MPPS range. This consistency results in a high level of stability in the generation of aerosols and removes the need for isokinetic sampling. Thanks to its state-of-the-art embedded technologies, the AGF Series can be used to test filter samples effectively, and has done so for over 25 years.